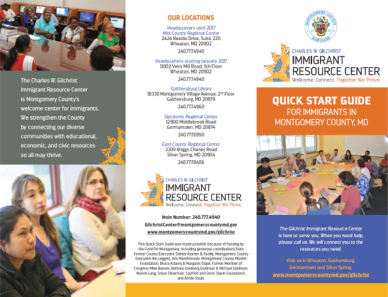 You are probably aware that recent political changes have created a sense of heightened anxiety among many of the immigrants who live in our local community and who depend on Gaithersburg HELP for food, infant needs, transportation, and medicines. On behalf of the Gaithersburg HELP leadership team, we would like to detail some of the steps we’re taking to guide clients to trusted sources for information and help as well as to reassure our clients that we support them. On the Updated FAQ on Immigration Information, other important links are: American Immigration Lawyers Association and MCPS’ webpage on Immigration Information. In addition, we have furnished flyers and brochures at the pantry to be placed in clients’ grocery bags and posted helpful guidance on the pantry bulletin boards. In the pantry waiting area, we have also provided copies of the Gilchrist Center brochure in Español and brochure in English. The HELP leadership team is prepared to guide clients who face increasing uncertainty and will continue to take steps to reassure and inform our clients in the days and months ahead. HELP is blessed to have the support of people who care and want to assist others beyond meeting their physical needs.